Prenatal genetic screening is intended to provide information about the health of the fetus. Prenatal screening can bring to light serious disabilities, such as congenital, genetic, and/or chromosomal problems. Generally, prenatal screening is offered as part of routine prenatal care, such as maternal serum screening, or if the mother is at risk of having a child with a serious genetic condition due to mature age or family history. See the following page for more information on prenatal blood screening programs in Canada. • Be comprehensive and include information for parents and clinicians that is easily understood so that informed decisions can be made. • Have timely access, a system to provide results and referral for follow-up testing, and access to treatment. • Allow women and families to refuse testing at each step. • Have the ability to incorporate new technology. Source: Chitayat D, Langlois S, Wilson RD. 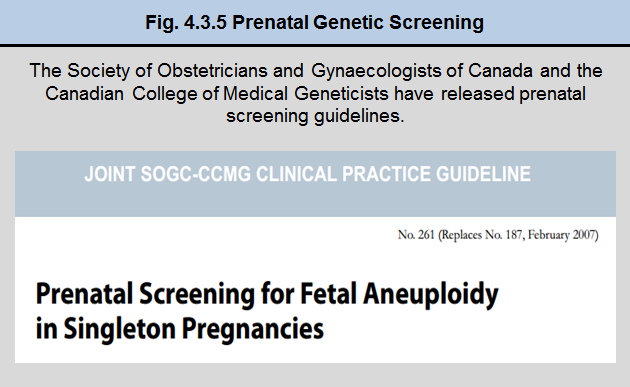 Prenatal Screening for Fetal Aneuploidy in Singleton Pregnancies. Joint SOGC-CCMG Clinical Practice Guideline No. 261 (Replaces No. 187, February 2007). http://www.sogc.org/guidelines/documents/gui261CPG1107E.pdf.